The Mason chassis, reskinned in orange sheetmetal for 1985, takes a trip down the Webster City backstretch. Late Model driver Jim Jorgensen has been chosen for the Dirt Driver Spotlight for his 2000 season track championship and many years of racing success on the dirt tracks throughout the region. Jim�s family resided in South Omaha when Jim was born on August 2, 1950, but later relocated to a farm near Bennington, Nebraska. Jim attended elementary school in District 30 and graduated from Bennington High School. While growing up he was your typical "car guy", always tinkering with vehicles around the farm. When the Hadan family opened Sunset Speedway in 1957, Jim's father Albert went to work as the pit gate man, and also maintained the track�s lighting. Jim's mother Susan could be seen every week in the grandstands with the kids. During those early years, the Jorgensen family cheered on Albert�s cousin, Leonard Christofferson, who drove the #97 Modified Coupe, the number that Jim would adopt many years later to start his own racing career. Jim's future wife Nancy Fox also regularly attended the races with her family. Little did these two kids know at the time that this would be the beginning of a long-term relationship with each other and racing. In the 60�s, Jim and Nancy had many dates at Sunset and were finally married in 1970. 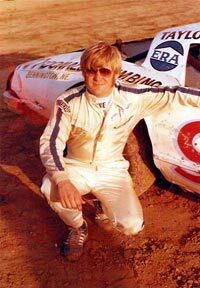 Jim's driving career started in 1971, while helping his cousin, Steve Jorgensen, with his Late Model. Jim�s first opportunity behind the wheel was totally unplanned. "Steve was in the Sunset Inn during intermission and didn�t make it back to the car in time for his next race. So I jumped in and drove it!" Jim laughs. Jim ran very well in that first race. He also piloted Steve�s car a couple more times at the end of the year in Nebraska City and Harlan. The following year, Jim and brothers Jerry and David bought their first race car, a '65 Chevelle, from Larry McAllister and Phil Reeves and raced it for three years in the Sportsman class at Sunset. Jim scored his first A Feature win and finished in the top five in points in 1974. Rules at the time stated that the top five point finishers from the Sportsman class were required to move up to the Late Model class the following year. So in 1975, they bought a 69 Camaro built by Keith Leithoff. "Keith and other veteran drivers Bill Wrich and Glenn Robey were valuable mentors during my rookie season in the Late Models," Jim admits. Jim improved every year, and in 1979, while partnering with Bill McDonald, he won his first Late Model A Feature. 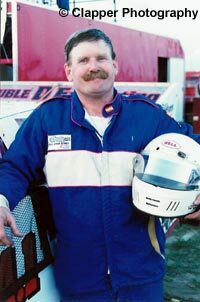 Jim and Bill added a third partner, Keith Lienemann, and began "Outlaw" Late Model racing in 1983 with a Wayne Mason built chassis, touring many tracks throughout the Midwest. Highlights included a second place finish behind Don Hoffman at I-70 Speedway, a third at Colorado National Speedway, and a fourth in Rapid City. Jim continued racing Late Models in the mid 80�s but eventually expanded his career another direction. In 1984, after a successful night at Eagle Raceway, Jim was introduced to car owner Dave Doll. Shortly afterwards, Doll hired Jim as his Modified driver. With help from Crew Chief Mark Welsher, Jim scored many wins in Doll�s Sardeson chassis over the next several years. Another great contributor to the team was Gary Tarascio, who sponsored the car with Tarascio Auto Body, and also served on the crew. Wins included nearly every trophy dash and the Race of Champions at Corning, and the Sprint Modified Special at Sunset Speedway. As successful as his stint in the Modified was, his love of Late Model racing returned him to the class in 1993. After running several years in the premiere division, Jim dropped down to the more affordable Grand National Late Model class in 1997, running regularly at Sunset and I-80 Speedway. Jim won several Grand National A Features in the late 90�s using both Shaw and Rocket chassis. During this period, racing really became a family affair, with brothers David and Jerry, nephew David Jr., and car owner Dave Doll also now competing in the division. "I enjoy competing with and against them all and enjoy their successes as much as my own," says Jim. Jim�s two sisters, Joanie and Hattie, who rarely miss a race, are also great backers of the entire Jorgensen clan, contributing to the team by taking photos, videotaping, and cheering their family team on every week. "If it wasn�t for them, we would have very few pictures and no films whatsoever," admits Jim. In late 1999 Doll purchased a Rocket chassis for Jim to drive in the full Late Model class once again. Plans fell together perfectly for the making of a dream season in 2000. Jim would drive the Late Model at Sunset, with the return of Mark Welsher as the Crew Chief. And he would pilot the Grand National at I-80, with Dave Stuckey joining the team as its Head Wrench. Other crew members included Travis Conant, Ben Bickle and two nephews, Cale Windorski and Adam Hoffman. WOW! Country 94.1 came on board as primary sponsor of both cars. The high expectations heading into the season were met as the team enjoyed much success. Jim had many good runs with the Late Model, including respectable 16th and 17th place finishes in two O�Reilly All-Star Series 100-lap specials at Denison and Sunset. And his season in the Grand National was nothing short of remarkable. Jim won numerous I-80 features, many from starting deep in the field. But the highlight of the season, as well as Jim�s illustrious 30-year career, was clinching the I-80 Track Championship, capping off all the success that he has enjoyed over the years. With all of the celebration that a championship brings, Jim and Nancy are also quick to remember all of their friends whom they have lost during the past 30 years of racing. They dedicate their championship to the memories of former crew member and sponsor Gary Tarascio, Dwight Wrich, Curt Zuhlke, Ted Hansen, Michael George, and Jim�s father Albert Jorgensen, who passed away last year. When Jim isn�t racing, he is a self-employed truck driver. He and Nancy also enjoy spending time with their daughter Jodie, son-in-law Eric and grandsons Eric and Elijah. Jim enjoys listening to country and Christian music. His favorite song is "When You Say Nothing At All" by Allison Kraus. He also enjoys music by Celine Dion. Jim likes romantic movies. Being a huge Meg Ryan fan, "Sleepless in Seattle" is his favorite. When Jim isn�t watching racing on ESPN and TNN, you can find him tuned in to the classic comedy shows, such as Andy Griffith and Leave It To Beaver on TV Land. Jim�s tastes are pleased with almost any food. "Although," he points out, "I avoid hot dogs during the winter since it makes up my main food group during the summer months at the race tracks." With the hectic racing schedule that has been a large part of Jim and Nancy�s entire life, one of their favorite pastimes during the off-season is to simply relax around their new Omaha home and catch up on visiting with friends. Devout Christians, they also enjoy spending time with their church family. Jim looks up to several racers as his heroes. He admires Bill Wrich and Marv Kruse because they were both farmers and racers. He has a lot of respect for Gary Webb and the entire Kosiski family for all they have accomplished. He is also a big Mark Martin fan. "I even got a Mark Martin haircut once," jokes Jim. Jim is also very proud of former crew member Tom Ackerman, who now lives in Charlotte and has worked on many NASCAR Winston Cup and Busch Grand National teams. Jim�s future plans in racing are to race for a couple more years and then retire from driving and focus on helping the younger drivers in the sport. When asked if there were any plans for molding his grandsons into future racers, Jim laughs and says, "My daughter would kill me!" Nevertheless, he gives the future generations of Jorgensen fans a dash of hope by quickly pointing out that his oldest grandson�s first word was "car." And if racing runs as strongly in the blood as the Jorgensen family would indicate, the racing community will surely not be surprised when, a couple decades from now, Eric and Elijah are dueling to the checkers, following in their grandpa�s footsteps. dirtdrivers.com supports all sites that support racing! New links are continually added to the site!